Carlos Samuel Estévez … resides in his hometown of Santo Domingo, D.R., in the offseason with his parents ... Has an older brother, Cesar Saul, and sister Susane ... Learned English from watching American TV shows ... Attended Mountain State Academy in West Virginia his junior year of high school, where he played baseball. Spent a majority of the season on the disabled list due to a left oblique strain and right elbow strain ... Made 28 appearances for Triple-A Albuquerque, going 0-1 with a 6.35 ERA (28.1 IP, 20 ER), 11 walks and 35 strikeouts ... On 10-day disabled list with an oblique strain from March 26 to April 23 when he was transferred to the 60-day DL with an elbow strain … had two rehab stints with Albuquerque (April 5-16, and June 25-July 15) … reinstated from disabled list and optioned to Triple-A Albuquerque on July 15. After making his first career Opening Day roster, appeared in 35 games with the Rockies across eight stints, including two stints as the 26th man in a doubleheader...Went 5-0 with a 5.57 ERA (32.1 IP, 20 ER), 14 walks and 31 strikeouts...Made his first career postseason appearance in the National League Wild Card Game at Arizona on Oct. 4 … allowed one run on one hit in 0.1 innings pitched...His five wins as a reliever were tied for the most among Rockie relief pitchers and tied for 11th-most in the National League...Finished the regular season on a six inning scoreless streak … was scoreless in 11 of 14 outings after his last recall on Sept. 1, going 0-0 with a 3.86 ERA (11.2 IP, 5 ER) with six walks and 12 strikeouts over that span. Made his Major League debut and ranked third among Major League rookies with 11 saves...Recorded 11 saves in 18 opportunities, the most saves by a rookie in franchise history...Led the team with 55.0 relief innings pitched … his 63 appearances were second-most on the club and the most among right-handed pitchers...Earned his first career save on June 11 vs. San Diego and his first Major League win on May 21 at Pittsburgh...Became the first Major League rookie since Trevor Rosenthal (2013) to record three consecutive saves...Recorded seven saves in as many opportunities in July, posting a 1.80 ERA (10.0 IP, 2 ER)...Led the Rockies in strikeouts as a reliever with 59...Only allowed 23.4% (4/17) of inherited runners to score. Split time between High-A Modesto and Double-A New Britain, going a combined 5-3 with a 3.40 ERA (55.2 IP, 21 ER), 18 saves in 23 opportunities, 68 strikeouts and 14 walks…Set career-highs in innings pitched, saves, strikeouts and WHIP (1.17) with a career-low 3.40 ERA…Began the season with High-A Modesto where he went 5-0 with a 1.37 ERA (19.2 IP, 3 ER) and five saves before being promoted to Double-A New Britain…Recorded 13 saves in 17 opportunities with New Britain, the second-most saves on the club, as the primary closer in the second half of the season … registered 43 strikeouts to only nine walks….Was named a Rising Star in the Arizona Fall League after going 1-2 with a 3.97 ERA (11.1 IP, 5 ER) and six saves in 11 outings for the Salt River Rafters…Was added to the Rockies 40 man roster Nov. 20. Appeared in 33 games out of the bullpen for Low-A Asheville, holding opposing batters to a career-low .238 batting average...Struck out 50 batters while walking only 11 for a 4.54 strikeout-to-walk ratio. Began the season by posting a 1.20 ERA (15.0 IP, 2 ER) in eight outings in April … struck out 17 batters while walking only three. Spent a majority of the season with Rookie Level Grand Junction after appearing in two games for Short-Season Tri-City to begin the season...Appeared in 22 games for Grand Junction, going 5-1 with a 3.79 ERA (35.2 IP, 15 ER)...His 35.2 innings pitched for Grand Junction were the most on the club by a reliever. Spent his second consecutive season with the Dominican Summer League Rockies...Went 3-3 with a 3.35 ERA (45.2 IP, 17 ER) in nine starts, 0-0 with an 8.31 ERA (8.2 IP, 8 ER) in three relief appearances...Pitched a seven-inning complete game Aug. 9 at the DSL Cubs … allowed only one unearned run on three hits and one walk while striking out two. Made six starts and two relief appearances for the DSL Rockies in his first professional season...Pitched a five inning complete game in his last start of the season, Aug. 16 vs. the DSL Diamondbacks...Struck out five batters in two innings in his first professional outing, June 18 at the DSL Diamondbacks. April 2, 2019 Colorado Rockies recalled RHP Carlos Estevez from Albuquerque Isotopes. 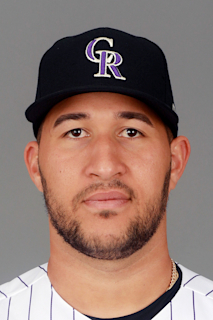 March 23, 2019 Colorado Rockies optioned RHP Carlos Estevez to Albuquerque Isotopes. January 12, 2019 Toros del Este placed RHP Carlos Estevez on the reserve list. November 13, 2018 RHP Carlos Estevez assigned to Toros del Este. July 15, 2018 Colorado Rockies optioned RHP Carlos Estevez to Albuquerque Isotopes. June 25, 2018 Colorado Rockies sent RHP Carlos Estevez on a rehab assignment to Albuquerque Isotopes. April 23, 2018 Colorado Rockies transferred RHP Carlos Estevez from the 10-day disabled list to the 60-day disabled list. Right elbow strain. April 5, 2018 Colorado Rockies sent RHP Carlos Estevez on a rehab assignment to Albuquerque Isotopes. March 29, 2018 Colorado Rockies placed RHP Carlos Estevez on the 10-day disabled list retroactive to March 26, 2018. Left oblique strain. September 1, 2017 Colorado Rockies recalled RHP Carlos Estevez from Albuquerque Isotopes. August 14, 2017 Colorado Rockies optioned RHP Carlos Estevez to Albuquerque Isotopes. August 5, 2017 Colorado Rockies recalled Carlos Estevez from Albuquerque Isotopes. July 31, 2017 Colorado Rockies optioned RHP Carlos Estevez to Albuquerque Isotopes. July 30, 2017 Colorado Rockies recalled Carlos Estevez from Albuquerque Isotopes. July 29, 2017 Colorado Rockies optioned RHP Carlos Estevez to Albuquerque Isotopes. July 25, 2017 Colorado Rockies recalled Carlos Estevez from Albuquerque Isotopes. June 22, 2017 Colorado Rockies optioned RHP Carlos Estevez to Albuquerque Isotopes. June 18, 2017 Colorado Rockies recalled Carlos Estevez from Albuquerque Isotopes. June 9, 2017 Colorado Rockies optioned RHP Carlos Estevez to Albuquerque Isotopes. May 30, 2017 Colorado Rockies recalled Carlos Estevez from Albuquerque Isotopes. May 19, 2017 Colorado Rockies optioned RHP Carlos Estevez to Albuquerque Isotopes. May 18, 2017 Colorado Rockies recalled Carlos Estevez from Albuquerque Isotopes. May 3, 2017 Colorado Rockies optioned RHP Carlos Estevez to Albuquerque Isotopes. August 22, 2016 Colorado Rockies recalled Carlos Estevez from Albuquerque Isotopes. August 19, 2016 Colorado Rockies optioned RHP Carlos Estevez to Albuquerque Isotopes. April 22, 2016 Colorado Rockies recalled Carlos Estevez from Albuquerque Isotopes. March 18, 2016 Colorado Rockies optioned RHP Carlos Estevez to Albuquerque Isotopes. November 20, 2015 Colorado Rockies selected the contract of Carlos Estevez from Hartford Yard Goats. May 17, 2015 RHP Carlos Estevez assigned to New Britain Rock Cats from Modesto Nuts. April 4, 2015 RHP Carlos Estevez assigned to Modesto Nuts from Asheville Tourists. June 23, 2014 Asheville Tourists activated RHP Carlos Estevez from the 7-day disabled list. May 19, 2014 Asheville Tourists placed RHP Carlos Estevez on the 7-day disabled list. March 31, 2014 RHP Carlos Estevez assigned to Asheville Tourists from Grand Junction Rockies. June 20, 2013 RHP Carlos Estevez assigned to Grand Junction Rockies from Tri-City Dust Devils. June 10, 2013 Carlos Estevez assigned to Tri-City Dust Devils from DSL Rockies. June 18, 2011 Carlos Estevez assigned to DSL Rockies. May 31, 2011 Colorado Rockies signed free agent RHP Carlos Estevez to a minor league contract.